Add Audio File to the Playlist. There are a few ways to add file to the playlist, you can drag and drop from Windows Explorer or use buttons provided on the playlist. 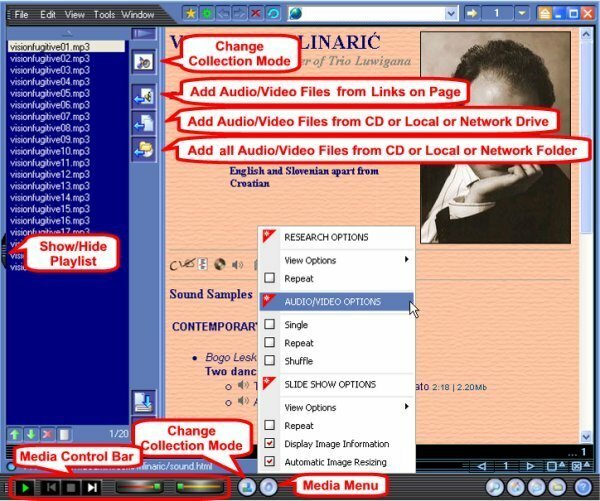 Use Add Audio/Video Files From Links on Page button to add internet files, Add Audio/Video Files from CD or Local or Network Drive button for selecting a single file or some selected files, Add all Audio/Video Files from CD or Local or Network Folder button to add all files in a CD or a folder. Media Control Bar has the following controls (from Left to Right) : Play/Pause, Previous Song, Stop, Next Song, Volume Control, Seek Box. You can now close the Playlist if you like (to get more space for the web pages) by clicking on Show/Hide Playlist button (Figure 1).